It happened both slowly and suddenly, but somehow much of my wardrobe has quickly been taken over by spandex clothing/Black Milk! Since Black Milk has a new release coming out tonight which includes some NEW Star Wars pieces, this week’s Stunning Style features one of the earlier pieces from their Star Wars Collection, and the different ways you can dress it up/down and accessorize it. The Star Wars Manga Dress from Black Milk is probably my favorite piece of their Star Wars Collection. Black and white go with everything, and it’s a great statement piece. It was a given to pair this dress with Her Universe’s Star Wars Manga hoodie of the same print. It’s not everyday you can have two pieces of clothing that share the same design! 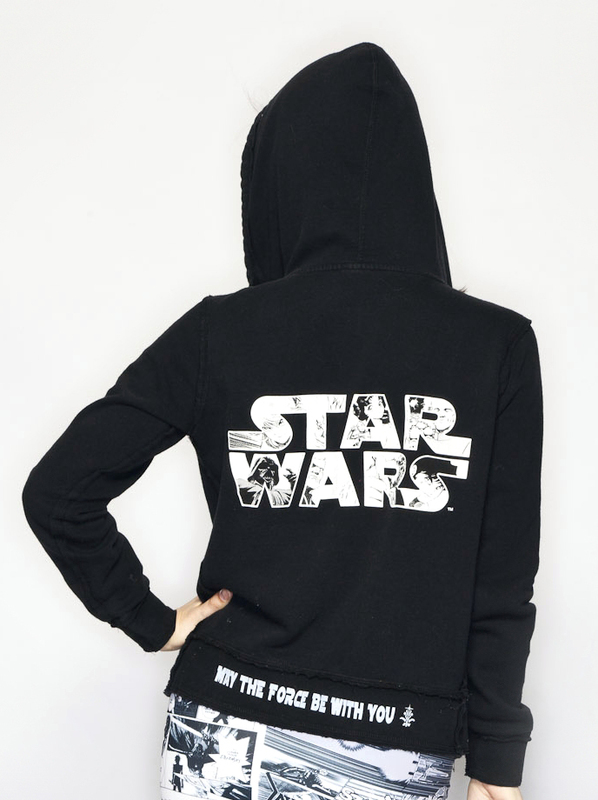 Unfortunately Her Universe no longer offers that hoodie, but they are always coming out with stylish new pieces every few months. While the hoodie is great to wear with this outfit because of the shared print, it gives the overall look more of a casual feel. If you’re looking for something a bit more trendy for a night out on the town, bolero and crop jackets are a great pairing with Black Milk dresses. I picked up this crop jacket by Buddhaful at San Diego Comic Con a few years ago and always get complimented for it. Layering an outfit helps to give a more polished look, and I love that layering with a short jacket still allows most of the print to be seen. These are just knock-off Jeffrey Campbell shoes I got in the LA Fashion District. Black Milk uses JC shoes for their models, so a lot of girls tend to pair their outfits with JC shoes – I own real JCs and they are incredibly comfortable if you can afford to get a pair. The JC “Lita” style is quite popular in general, and you can find similar shoes in department stores. Solestruck is a great place to check out JC shoes, and other brands! Etsy is always my go-to source for great Star Wars jewelry. The dangly Stormtrooper earrings are by Jennifer Landa at her shop, Rockets and Rainbows. The Darth Vader Helmet rings, shown in black and pink, I actually made myself and offer for sale on my store. I made the Han in Carbonite necklace as well (available for sale soon), but a few sellers offer something similar on Etsy. Rock Rebel is always the leader in stylish Star Wars handbags. It’s not picture here, but for one variation of this Look, I paired their sparkly pink Bowling Bag with my pink Darth Vader Helmet ring to add a pop of color to an otherwise completely black and white palette. But of course I just had to pair the black and white dress with Rock Rebel’s black and white Checker Bag! A lot of my Looks this time around will be like this one where I change up a jacket, shoes, or even accessories, to show you how changing just one piece of your outfit can alter the overall look of an ensemble depending on the occasion you want to wear it for. We’d love any feedback you have on our Looks, and if you have your own looks you’d like to share, we’d love to see them! Feel free to contact us through our blog, or on our Facebook Page. And don’t forget, we’re also on Twitter, and now on Instagram (username: settostunning)! I love your jacket! Where is it from? Thank you! I found the info and updated the post. It’s by Buddahful.